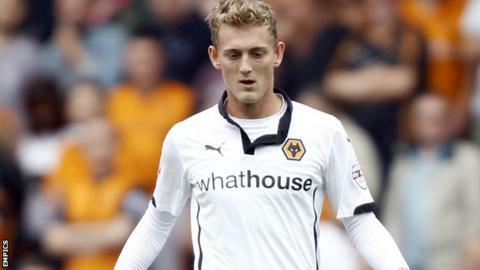 League One side Millwall have signed Wolves midfielder George Saville on a 28-day loan deal. This season the 22-year-old has been limited to only two appearances for the Championship club, who are managed by ex-Lions boss Kenny Jackett. Saville had a brief loan spell at The Den in 2012-13, featuring three times for the south-east London side. "He comes highly recommended by Kenny both as a player and a person," Lions boss Neil Harris told the club website. Saville, who joined Wolves in 2014 after beginning his career at Chelsea, has also spent time on loan at Brentford and Bristol City. Harris had been looking to strengthen his squad after Jimmy Abdou and Ed Upson sustained injuries in Saturday's 5-3 defeat at Peterborough. "Losing both Jimmy and Ed to injury for a period of time was a blow," he added. "George has won promotion out of this division with Brentford and also helped Bristol City achieve the same success last season, so is used to this league and the level of competition. "George plays for a Wolves side who line up in a similar system to us so he will have the knowledge to play the way we like to." Klopp and Liverpool - a match made in heaven? Read more on Klopp and Liverpool - a match made in heaven?